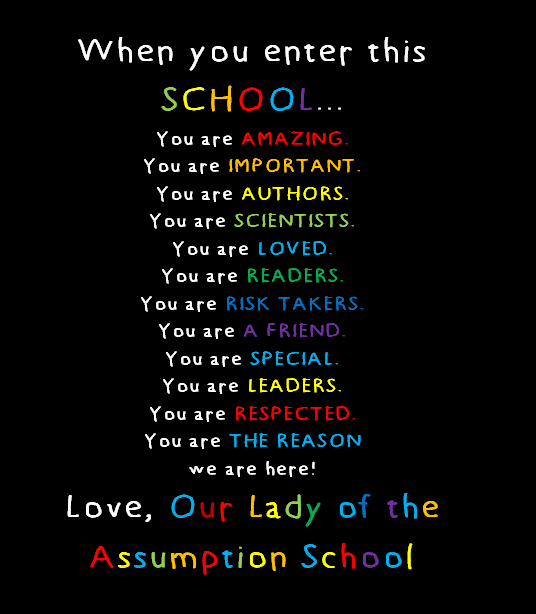 Welcome to the 2014-2015 school year at Our Lady of the Assumption School. The year promises to be terrific. We welcome new students, families and staff to the school. Most of our classes are currently at a good size. In a few cases, class sizes are larger. Please note that we may have to adjust some class assignments as a result of new enrollment and adjust numbers of students in different grades. We will make these adjustments as quickly as possible to minimize the effect on students. • Our first School Council meeting is on Tuesday, September 23rd at 6:30 pm. This summer I did more reading about transformation in education. We are entering a very exciting time. A key focus of transformation is collaboratively meeting the needs of ALL learners. Our staff is excited about trying some new teaching methodologies and programs, including Project Based Learning. We are going to continue to increase communication using technology. Soon you will receive a letter asking for your email address to send school information. You are also invited to “like” us at our school Facebook page and follow us on Twitter, the school @OLAlethbridge and me @GregKostiuk. I invite you to check out our school website at www.holyspirit.ab.ca/assumption/ to get some valuable information including: the 2014-15 School Calendar, our school supply list, and a lot of other “stuff”. Please contact the school if you have any questions. We look forward to working with you to continue to make Our Lady of the Assumption School a great place. On behalf of our staff, I wish you and your children a successful school year.